In recent weeks we have been running an open beta version of a brand-new integration with popular accounting software package, Xero. Some of our eagle-eyed users may have spotted references to this throughout our app, or perhaps even seen our help guides. Staying true to our ethos, this new feature has been available to all of our users, at no extra cost, but we’ve kept things unofficial whilst continuing to develop this integration. We’ve now got to the point that we are delighted with how it is working, and are keen to let everyone know! Many thanks to those incredibly understanding clients who’ve worked with us to get it to this stage. Boiled down to its simplest essence, this integration allows you to quickly export your EPoS sales data from your Kobas cash logs directly into Xero organisations by raising and paying invoices. 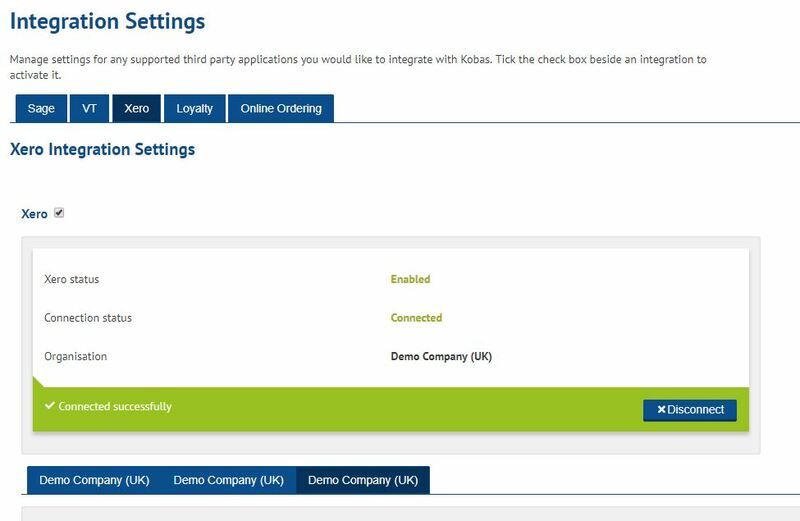 Once the integration is activated, and your Kobas and Xero accounts have been linked, you will be able to swiftly assign account codes from Xero to their corresponding sales lead types and methods of payment from within the Kobas Integration Settings page. If your venues operate under different legal entities, then we will automatically pull in the details of each organisation and you can then match each venue to its relevant company. When the time arrives to export your data, simply select your date range, and at the click of a button Kobas will automatically raise sales invoices within Xero without you having to input anything more than your Xero password. This feature is certain to save your accounts department a lot of time. Whilst we’re very happy with this release, we are always looking to improve our offering; our integration currently exists as a ‘public’ Xero application, but our next step will be to upgrade to a ‘partner’ application, which will provide our users with further benefits and make the already simple, even simpler! That’s all for now; if you’d like some help getting this set up in your account, please get in touch with our support desk. If you want to keep abreast of all our updates, then check out our Cloud and EPoS change logs, or follow us on Twitter.